(CNN) -- Yume-Hotaru's first novel was a best-seller in Japanese bookstores, and he wrote it entirely with his thumbs. Publishers in Japan were quick to see the potential of putting cellphone novels into print. 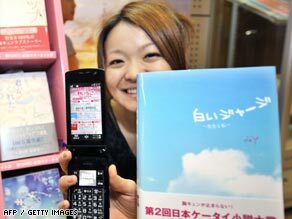 The 22-year-old who would rather be identified by his pen name than his real one (Yume-Hotaru means "Dreaming Firefly" in Japanese) started composing the novel on his cell phone in 2007. Some literary purist don't think the cell phone novels constitute real literature, but their popularity is undeniable. "The sentences may be a bit immature. It doesn't have a major plot line sometimes. It is just love stories of ordinary high school girls, said Aya Tanaka, a spokesperson for Goma. "But it is kind of like popular comics, it is what the teenagers want to read, and for the publishers, it is quite a big market and it does sell."